Renovating your entire kitchen is a lot of work and will likely cost you a lot of money. The good news is that there are other options available if you are looking to bring new life into an outdated kitchen. If your space looks tired and worn out, you can refresh your kitchen and make it look new again with kitchen cabinet refinishing. Not only is it an effective way to dramatically improve the look of your entire kitchen, but it also costs a fraction of the price of a full-scale kitchen renovation. Here are some tell-tale signs your kitchen needs cabinet painting. Did you know that a full-scale kitchen renovation can cost over $50,000 in some cases? If you don’t have that kind of money for a project like this then finding a more affordable way to upgrade your kitchen is your only option. Repainting and refinishing your kitchen cabinets typically costs a small fraction of the cost of replacing your cabinets. Do you love to host but don’t have enough storage space? Is your kitchen the hangout spot for your family but the room feels dark and drab? Kitchen cabinet refinishing can brighten up the space with fresh new colours and allows you to upgrade the hardware (think self-closing hinges, door pulls or stylish new door knobs) to bring your kitchen back into the 21st century. Every year perfectly good material is tossed into dumpsters. Older wooden cabinets are typically much better quality than new retail kitchen cabinets. It makes no sense to scrap everything and start from scratch. Instead, it’s much smarter—and environmentally friendly—to simply have your cabinets refinished and repainted. First of all, this method is much more affordable and secondly, it will maintain the quality of your existing cabinets. If you’re planning on selling your home anytime soon, the old quirks that you love about your home may not be as appealing to prospective buyers. Did you know that the average return on investment of renovating your kitchen is 70% when you sell your home? A complete renovation may not be in your budget to prepare your home for sale and is extremely time-consuming. However, if you want to get the maximum value for your home, a quick and easy kitchen cabinet refinishing project can give your kitchen a facelift and save you a ton of money in the long run. 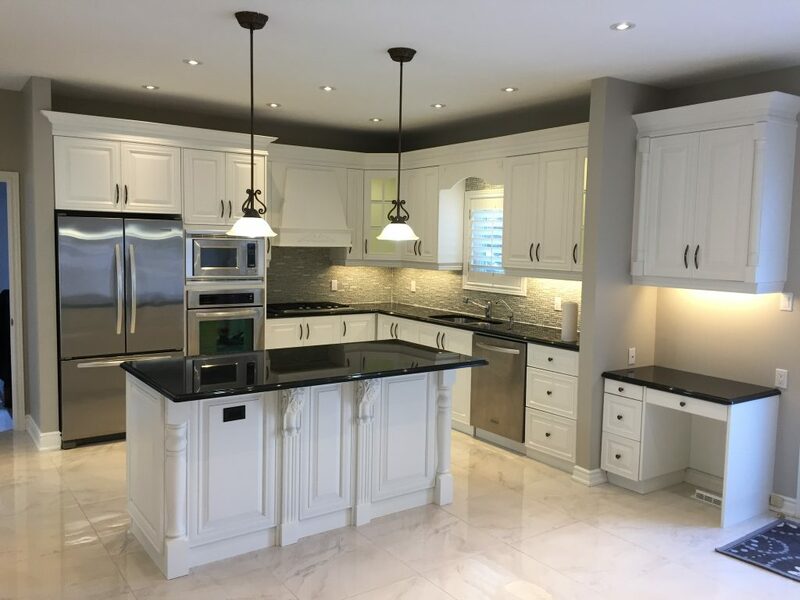 Do you need kitchen cabinet refinishing in Aurora, King Township, or the Toronto area? Look no further than Booth7. We can give your home a quick, affordable upgrade with our refinishing services. We think outside of the box when it comes to home upgrades, and there are many affordable projects we can do for you to dramatically transform the look of our kitchen. We are a one-stop shop and our professionals will handle all the details of your project from start to finish, so you can trust us to get the job done right! Ready to get started? Simply fill out our online form or contact us at info@booth7.com. Our staff with respond to your inquiry within a few hours. If you have a specific idea in mind, let us know and attach a photo of your existing room and get a free consultation and estimate today!